On 18 September 2014, 4,283,392 ballots were cast in the referendum asking a simple question. While the "No" votes won the day, it is generally agreed that Scotland and the entire United Kingdom is likely to see wholesale change as devolution of more powers from London to Edinburgh takes place. As I was watching the election results come in, Thursday night, I could not help but wonder what Scotland's vote could teach us about resurrecting Milton and Campbell counties. 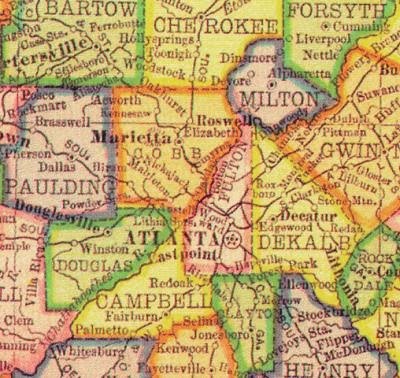 In Fulton County, where I live, there is a long-standing discussion about re-creating the two counties that merged to form Georgia's largest county. Eighty-three years ago, Campbell County and Milton County both went bankrupt. The two cash-strapped counties combined with Fulton County to give us the borders we know today. A lot of people, myself included, believe that while consolidating Milton and Campbell counties into Fulton made sense in 1931, it makes little sense to keep Fulton County as it is now. Quite frankly, Fulton County has become too big for its britches. It is bloated. It is dysfunctional. Fulton County is out of touch with its residents, and should be split up. In order for that to happen, though, a referendum similar to the one that took place in Scotland would have to occur. So what can we learn from the Scottish Independence Referendum as we continue the conversation on bringing back Campbell and Milton counties? Those on both sides of the Scottish independence debate had serious talks on substantive issues. There were public discussions on a variety of issues such as Scottish currency, the Scottish economy, and Scottish national defense. The informative deliberations on Scottish independence served as a bright contrast to the caustic rhetoric used by opponents of Milton and Campbell counties. Whenever splitting up Fulton County is even mentioned, those against it scream and shout "Racism!" at the top of their lungs. While it's good for TV, screaming racism isn't good for the public discourse. Debating the real ramifications of resurrecting Milton and Campbell counties is a far better use of time than accusing your opponents of racism. The MPs in the House of Commons all had their opinions on Scottish independence. Some felt the vote should not take place. Others felt all of the UK should vote on Scottish independence. Ultimately, it was decided that the people of Scotland should determine their destiny. Voter turnout in the Scottish Independence Referendum was 85%, meaning that nearly all of Scotland's people weighed in on the issue (including 16 year-olds allowed to cast a ballot for the first time). The Georgia General Assembly would have to authorize a referendum on Campbell and Milton counties. Just like in the UK, a lot of legislators have strong opinions on the issue. But the final decision on re-creating Campbell and Milton counties should rest with the people living in the old Milton and Campbell counties. They alone should determine their own destiny.